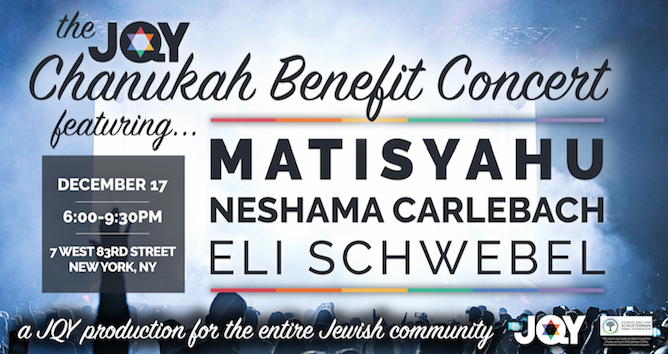 Featuring Matisyahu, Neshama Carlebach, Eli Schwebel, and surprise guest stars! Music can bring us together in miraculous ways. Join us for a once in a lifetime concert where people of all backgrounds, denominations, genders, and identities come together to light up the night, spreading the message that there is a place of worth for everyone in our community: YOUR WHOLE SELF BELONGS. All tickets include entrance to the concert and after party. This event is in loving memory of Mona Daniella Haddad and Marshall Koplitz. All general admission tickets include hot latkes, fresh sufganiyot and OPEN BAR (for those 21+) General admission does not include dinner or table service. This event is open to families, allies, friends, and newcomers to the JQY community. A portion of all ticket prices is tax deductible. This event was made possible through the Charles and Lynn Schusterman Family Foundation's Grassroots Events program, and by a generous donation from the Teitelbaum-Jacobowitz family.